Written by roy on Sept. 6, 2014 . Recently, my commute has (sadly) changed to include a daily trip to Chelsea (the one on Manhattan's west side). Exploring the possibilities, I decided to try the Metro North Railway to Grand Central, then hop a Citibike for the proverbial last mile (which is really about 2 miles). For regular use, it's a no-brainer to buy the $95 annual subscription, but to try it out to see if you like it, there's a 24-hour pass for $10. So that's what I did. Written by roy on Jan. 11, 2014 . Is the Python language an all in one computer language which could replace C, C++, Java etc? That's a really hard question to answer, or at least to answer well. Written by roy on Jan. 8, 2014 in testing. At Songza, we're very much into testing. Our test suite currently has over 600 individual test cases, with new tests getting written almost every day. Written by roy on Dec. 20, 2013 . 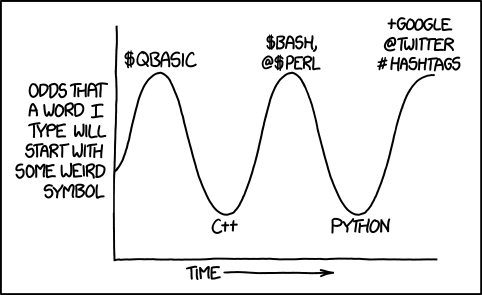 For the last 10 years or so, I've been doing mostly two languages; C++ and Python. It's hard to imagine two language which are more dissimmilar, but now I understand what the connection is. Written by roy on Oct. 27, 2013 . This is going to be short, because there's really not much to say. I just got back from seing Gravity. It's one of the stupidest movies I've ever seen. Even by the minimal standards of space opera, it was just plain dumb. End of review. Written by roy on July 18, 2013 . As everybody knows, social networks are all the rage these days. What makes a network valuable is not just how many people are in it, but how many ways those people are connected. So, if you own a social network, you need to not just work on adding people, but also on getting those people to create interconnections between themselves. Written by roy on Oct. 4, 2012 in testing. In an earlier installment, I wrote, I don't quite understand why, but most programmers don't like testing. I also hinted that I wasn't completely clueless about the reason. It's really quite simple. Their employers tell them that writing software is more important than testing it. Sure, at the all-hands meetings, some VP will get up there and drone on about how we're all part of the team, and everybody is important in their own way. Comes payday, however, the message is loud and clear. Written by roy on June 3, 2012 . Let's write our own language. Written by roy on June 1, 2012 . No, on second thought, let's not. One of the classic decisions any business has to grapple with is make-or-buy. From the smallest private enterprise in the consumer beverage space, to large government agencies in outer space, figuring out whether it makes more sense to roll your own or let somebody else do it for you is a decision that stares you in the face every day. Written by roy on May 20, 2012 . A TechCrunch article today an interesting statistic. 100 million person-hours to write all of Wikipedia. 175 million person-hours spent every day on Facebook. The mind boggles. I hate posting soundbites like this, but honestly, I can't think of anything more to say on the subject.